High-quality visual images are an essential component of nutrition and health social and behavior change (SBC) programming but can be difficult to find or produce. 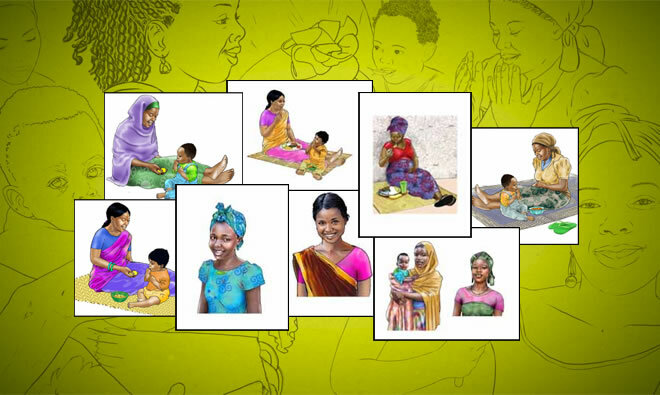 In 2010, UNICEF and partners developed an integrated nutrition SBC package known as the Community Infant and Young Child Feeding (C-IYCF) Counselling Package – investing in high-quality graphic illustrations for low-literacy contexts. Over the last six years, SPRING has supported the adaptation of this package for nutrition programs in India, Niger, Burkina Faso, Guinea, Sierra Leone, and Senegal. To facilitate the future use of high-quality, adaptable images in infant and young child feeding (IYCF) and other nutrition SBC programs, SPRING and UNICEF have collaborated on the IYCF Image Bank, a digital repository of images on topics related to IYCF/nutrition, hygiene, and health. The IYCF Digital Image Bank contains over 100 editable images from the generic UNICEF C-IYCF Counseling Package, and more than 600 additional images, including adaptations created for other countries and contexts. Users are encouraged to download, use, and adapt these images for non-profit purposes. The image bank is expected to grow with future contributions from end-users! The images contained in this bank were created using the Photo-to-Illustration (PTI) process, which is based on reference photography and digital technology. SPRING also developed two complementary products to accompany the IYCF Digital Image Bank - the Photo-to-Illustration Guide (forthcoming) and the Photo-to-Illustration Video Tutorial. The guide offers detailed information to orient SBC managers on the basic principles involved in the PTI process and benefits of using this technique. The tutorial provides an overview of the PTI process and tips for graphic artists. SPRING and UNICEF invite you to watch the recording below to hear from Peggy Koniz-Booher, SPRING, Maaike Arts, UNICEF HQ, and Andrew Cunningham, SPRING, present an overview of these new tools.